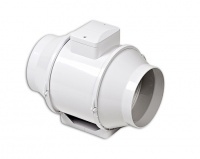 125mm fan 275m3/Hr. Mixed Flow In Line Duct Fans. Two-speed motors. Quiet running. Long life ball bearing motors and thermal protection to prevent motor burnout. Mixed flow technology for extra pressure development and longer duct runs. Cost effective yet still maintaining a high level of performance.